The Steppenwolf Theatre Company has opened its 40th season with the world premiere of a new adaptation of Steinbeck’s novel East of Eden by company member Frank Galati. Disappointingly, Galati has not been able to repeat the great success of his previous Steinbeck adaptation The Grapes of Wrath from 1988. While it is good that Galati’s stage adaptation does not try to imitate the famous 1955 film adaptation directed by Elia Kazan and starring James Dean, important points made clear in the film are not made clear on stage and the acting of the famous Steppenwolf ensemble is surprisingly uneven. East of Eden (1952), which Steinbeck considered his magnum opus, concerns the intertwined fate of two families – the Hamiltons and the Trasks. The first problem in adapting the novel is that the story of the Trask family is far more interesting than that of the Hamiltons. It is for that reason that the 1955 film adaptation begins halfway through the novel when almost all of the Hamiltons’ story has been told. Frank Galati’s stage adaptation, however, begins about 200 pages in the novel before the film adaptation with section three of Chapter 15. Here we meet Samuel Hamilton (Francis Guinan), who is dowsing for water on the dry land in the Salinas Valley of California that Adam Trask (Tim Hopper) has bought with his large inheritance. We hear how Adam says that his life has been changed for the better by his love for his wife Cathy (Kate Arrington), but when we meet her she is anything but loveable. Samuel helps her give birth to twin sons, but the only reward he she gives him is a fierce bite on the hand. She doesn’t want Adam or her children and when Adam tries to stop her leaving, she shoots him and disappears. When Adam finally tracks her down she is running a brothel in Salinas and taunts Adam that his children may be his brother’s not his own. The entire first act of Galati’s three-act version is occupied with this background, but it is completely unnecessary. The events of Act 1 are referred to frequently in the subsequent two acts, but since the accounts of what happened do not deviate from what we have seen, there is no real point to showing us these events. We don’t have to see Cathy give birth to twins to know she gave birth to twins. We don’t have to know she shot Adam and abandoned her infants when everyone agrees later, including Cathy, that that is what she did. Thus, the action of Galati’s adaptation does not begin until Act 2 when we see that Samuel is concerned that Adam hasn’t even bothered to name his two sons. Adam and Samuel reject the names Cain and Abel as too unlucky, even those were the names of Adam’s sons in the Bible. Instead, they choose Aron and Caleb, but as the symbolism of the initial letters shows us Aron and Caleb’s story will just be a variation on that of their biblical counterparts. The first time we see the dark-haired Caleb (Aaron Himelstein) and the light-haired Aron (Casey Thomas Brown), they have just shot a rabbit with an arrow, but neither can tell who actually shot the arrow. This innocent detail is already a clue to the meaning of their story since it points out how difficult it is to assign responsibility to any one person for a given action. The next time the two brothers contend it is for the favours of a well-brought-up girl Abra Bacon (Brittany Uomoleale). Both are attracted to her, but Caleb bows out in favour of Aron. Abra is his mother. Caleb, on the other hand, tracks Cathy down, sees what she has become and understands why Adam has hidden her existence from them. While Aron excels in school and plans to go to university, Caleb excels in business and wants to repay his father’s own business losses. How the two fare, why the secret of his mother is revealed to Aron and what consequences this has make up the remainder of the drama. 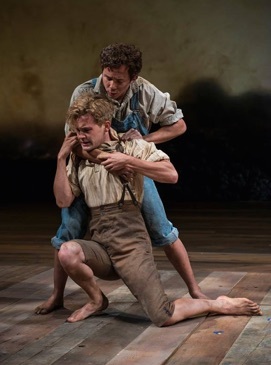 In a story so overtly based on Cain and Abel, it is natural that Caleb should refer frequently to how his father favours him over Aron and suffers under that lack of favour. The most important flaw in the last two acts of Galati’s adaptation is that he has no scene to demonstrate Adam’s preference until the climactic scene of Adam’s rejection of Caleb’s gift. Up to that point we have no way of judging from what is in the play alone whether Caleb’s obsession with his father’s disfavour is justified or not. To make matters more confusing, Adam’s reason for rejecting the gift – i.e. that Caleb is profiting from the distress of World War I – has not been sufficiently established. 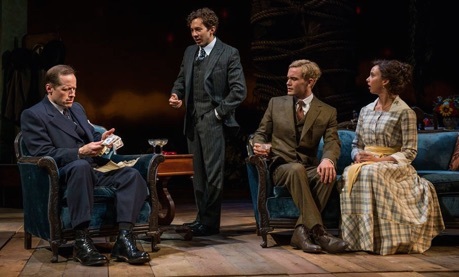 Galati has had Samuel’s son Will (Dan Waller) only say that the US may get involved in the war but never tells lets us know definitively that the US has joined in the war – a fact that has important consequences for both Caleb and Aron. The best part of Galati’s adaptation is to restore the character of Lee (Stephen Park) to the narrative. Lee is Adam’s Chinese-American cook, servant and spiritual guide, the man who raises Adam’s two boys and the man who stays with him until his death. Why Lee is so devoted to Adam is an increasingly niggling question that Galati never explains. It is a sign of the racism explored in the novel and still prevalent in 1952 that such an important character should be completely expunged from the film. The performances are uneven in an unconventional way: the acting of the three young principals completely outshines that of the three older principals. Tim Hopper successfully portrays Adam Trask as an idealist but essentially weak man, but until the final confrontation we never get a clue through word or sign that he favours Aron over Caleb. When that final confrontation comes, Adam’s rejection of Caleb seems completely arbitrary and unexpected since it has not been sufficiently prepared. Kate Arrington has the amazingly juicy role of Cathy Trask, Steinbeck’s own version of Shakespeare’s most vicious woman Margaret, “a tiger’s heart wrapp’d in a woman’s hide”. She is meant to be an embodiment of evil that begins to crumble only when she allows conscience to have any sway over her. Arrington’s notion of depicting this sociopath is to have her speak all her lines in the same measured monotone to show her complete indifference to the often repulsive content of what she says. The problem is that over the course of three hours, her unmodulated voice ceases to have a positive effect and soon becomes tedious. As Lee, Stephen Park does have the difficult role of constantly being the voice of reason. But like Hopper and Arrington, he, too, never varies his tone of voice except to speak more loudly or softly and, like them, he does nothing to signify through voice or gesture that he ages by twenty years through the course of the action. In contrast with the lacklustre performances of the adults, the actors playing the younger generation give highly nuanced performances. All three age themselves gradually from the rambunctiousness of childhood to a more formal manner of behaviour and a more complex view of the world in their late teens. Aaron Himelstein, who takes on the potential burden of playing the James Dean role of Caleb, casts off that burden by looking, sounding and acting in a completely different way to make the part his own. Though Galati gives us no evidence that Adam favours Aron over Caleb, Himelstein shows that Caleb has internalized his father’s disfavour and has begun to hate himself. Even early on when Caleb allows Aron to have Abra, Himelstein makes us feel that Caleb does this because he feels unworthy of her. Himelstein, who commands a remarkable intensity, shows us how Caleb struggles against the power of his negative side inherited from his mother to attempt to change himself and to do good. In his portrayal of this struggle Himelstein completely wins our sympathy. Casey Thomas Brown does not make Aron the blandly good brother in opposition to his “bad” brother Caleb. Rather Brown shows us that Aron, too, has personality problems. Aron’s game of mother and son that he plays with Abra seems not altogether healthy, and the way he delivers Aron’s lines with a slight overemphasis shows that Aron is a character who is not really prepared to face the world as it really is. We would like to know more why Aron suddenly decides not to go to university, but Galati omits to tell us. Brittany Uomoleale wonderfully depicts Abra’s journey from prissy young girl to the bearer of difficult secrets that make her mature before her time. Uomoleale enacts the difficult scene where Abra switches her affections from Aron to Caleb with such sensitivity that we completely understand her decision. The secondary roles are all well taken with Francis Guinan as a memorably crusty Samuel Hamilton and Elizabeth Laidlaw as Adam’s annoyingly cajoling Nurse. The production itself is beautiful to look at but quite elaborate for a play. 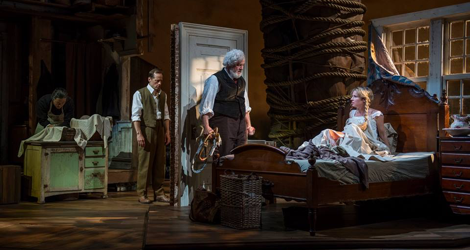 Designer Walt Spangler has the stage dominated with a potent symbol of the play – a huge tree split in half nearly down to the ground that people have attempted to save and make grow together by tying it round and round with heavy rope. The tree could serve for the background rift between Adam and his brother Charles or the rifts depicted between Adam and Cathy and assumed between Aron and Caleb. Sumptuously decorated set pieces glide in and out on several computerized wagons, one of which even revolves in place to depict the inside and the outside of the Trask home. Furniture arrives on stage and disappears again on a stage lift travelling through a drop and slide trap. Director Terry Kinney’s most effective use of the lift is for Cathy’s death scene where she and the chairs she is sitting in descend out of view as the character descends into unconsciousness. For a play set among farmers and in the none-too-scenic town of Salinas, one can’t help but feel a disparity between the high-tech level of the stagecraft and the humble to low-class nature of the settings. East of Eden does have the potential to work on stage but the present adaption will need major revisions to succeed. The first act should be dropped and that time used to explore more fully the family dynamics of Adam Trask with his two sons and his two sons’ interactions with Abra. The historical background needs to be made clearer so that we know what outside forces are driving some of the characters’ decisions. In addition to this, if the acting of the three adult principals had the same intensity and nuance as that of the three younger principals, the work work would increase immeasurably in power. Photos: (from top) Stephen Park, Tim Hopper, Francis Guinan and Kate Arrington; Aaron Himelstein as Caleb and Casey Thomas Brown as Aron; Tim Hopper, Aaron Himelstein, Casey Thomas Brown and Brittany Uomoleale. ©2015 Michael Brosilow.